Great Sand Dunes National Park, Mosca, CO.
Louise Speaks: Well this is our last stop in Colorado. It’s been a fast and adventurous 18 days. It was very cloudy as we arrived at the Great Sand Dunes www.nps.gov/grsa/index.htm and as we drove to the “sand” it began to rain. I’m not exactly sure what is so spectacular about this sand, but it is in Patricia’s Book “1000 Places To See Before You Die.” The park contains the tallest sand dunes in North America, rising about 750 feet from the floor of the San Luis Valley. The dunes were formed from sand and soil deposits of the Rio Grande and its tributaries, flowing through the San Luis Valley. Over the ages, westerly winds picked up sand particles from the river flood plain. As the wind lost power before crossing the Sangre de Cristo Range, the sand was deposited on the east edge of the valley. This process continues, and the dunes are slowly growing. The wind changes the shape of the dunes daily. It is very easy to experience the dune-building process. This is a very windy region, as hikers on the Sand Dunes will attest, as on many days they will be pelted by sand and even small rocks when hiking on the dunes. The wind carries sand and rocks from many miles away. While the dunes don’t change location or size that often, there are still parabolic dunes that start in the sand sheet, the outer area around the dunes, and migrate towards the main dune field. Sometimes they join the main dune field, and sometimes they will get covered with grass and vegetation and remain where they are. 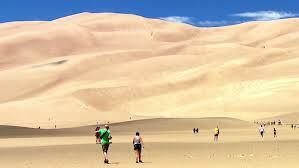 The dunes are relatively stable, however their morphology changes slightly with the seasons. The direction of the wind greatly affects the dune type. This wind regime is part of the reason why the dunes are so tall. Many visitors to the site try to sled down the dunes. The Park Service provides hints as to the best time to sled (when the sand is wet) and which equipment works best. Visitors anytime other than late fall through early spring are also advised to avoid bare feet or sandals, and stick with sturdy, closed footwear. While the sand looks alluring, its chocolate color absorbs heat. The daylight sand temperature can reach 140 degrees and will burn bare feet. Getting to the dunes requires walking across the wide and shallow Medano Creek, which flows only from spring to early summer. Hiking is permitted, with the warning that the sand can get very hot and the area gets snow in the winter. The dunes and surrounding area were designated a National Monument in 1932. On November 22, 2000, President Bill Clinton signed the Great Sand Dunes National Park and Preserve Act of 2000, aiming at ultimate national park status. Yes, it was a lot of sand, but I do live in Arizona where we have sand storms galore, so I wasn’t that impressed. That being said, I would rate the Sand Dunes a C-…it was just okay, but it wouldn’t have made my list of things to see. From here we are headed to Albuquerque for the 4th of July. We are not planning on doing much celebrating, we are ready to hit the showers and head home. Categories: Colorado, National Sites | Permalink.